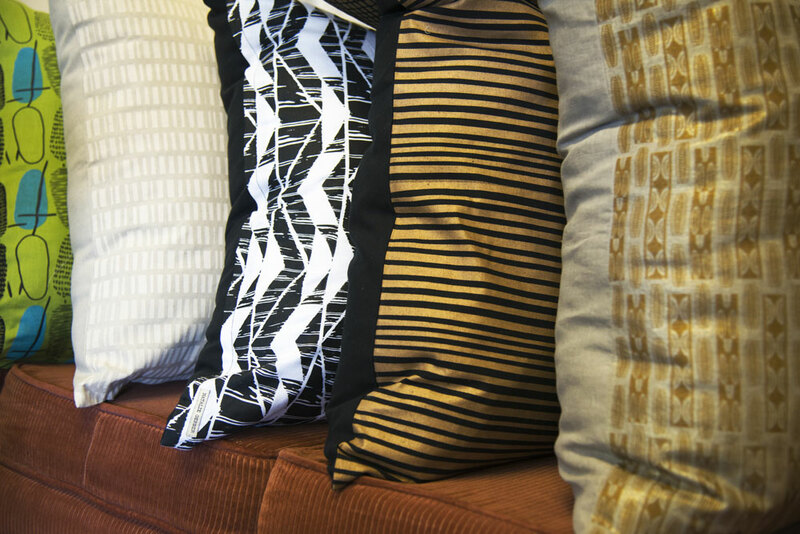 See why this local artist’s textiles are attracting a devoted following both locally and abroad. Surface designer Natalie Gerber arrived in Canada from South Africa with her family in 1995. Since then, she has studied and worked in fashion, creative pattern cutting, textiles and fibre art all over the world. Her education led to running a business designing and making wearable art garments and accessories using re-purposed fabrics, but she eventually found herself missing the hands-on practice of printing. In 2013, before the birth of her daughter, Gerber found herself refocusing her energy and rewriting her entire business plan. With the help of a small business loan, Gerber designed and fabricated a huge custom table that allowed her to screen print her surface designs on a large scale. Her focus now is on designing and printing functional, contemporary textiles from table linens to messenger bags to home decor. 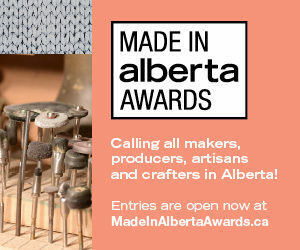 Shop directly from her website, or find her pieces for sale at Inspirati, Kit Interior Objects and the Glenbow Museum Shop. Natalie Gerber’s designs usually start out in her sketchbook, beginning with a process of mark-making or loose line drawing that eventually leads to a final pattern. 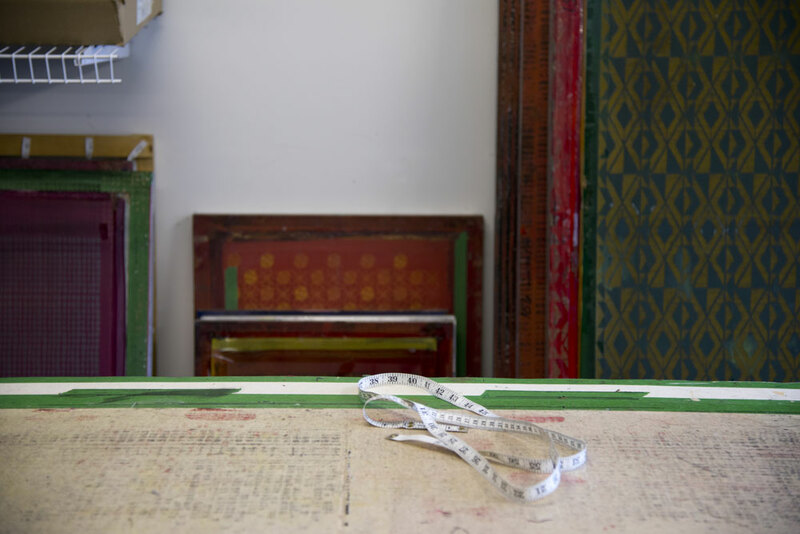 A digitized version is used to produce the screens she uses in the printing process. Some of the designs that Gerber creates are inspired by her upbringing in South Africa, but she also cites art nouveau, art deco and mid-century modern styles as important influences. 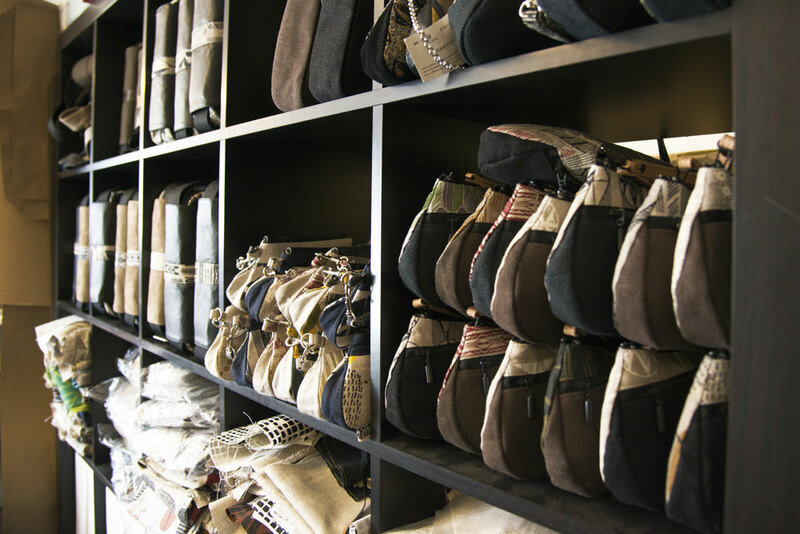 Gerber designs all the patterns for her products – all sewn in-house – such as the clutches and messenger bags lining these shelves in her studio. Gerber is a strong believer in community and collaboration. Locally, she is one of the co-founders of the New Craft Coalition, and internationally, she has worked in South Africa on the Kwadabeka Township Project, collaborating with artists there to develop designs for print. 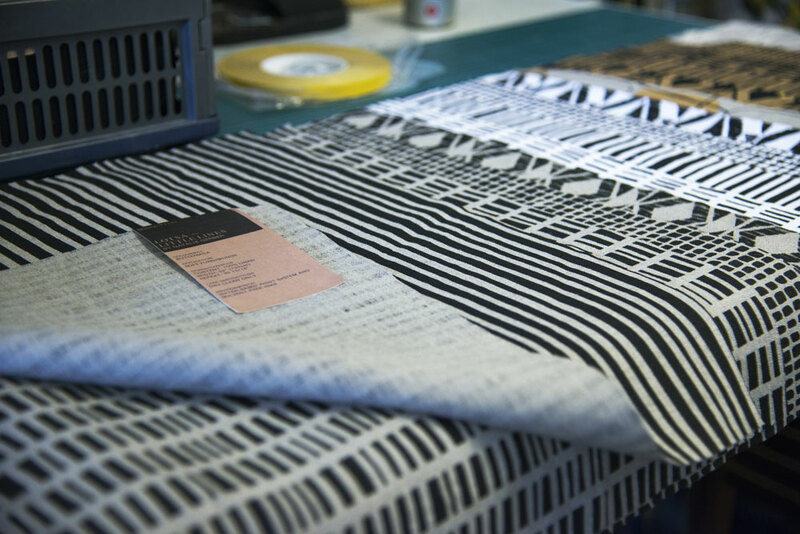 This fair-trade initiative pays artists for their designs, and a percentage of sales of textiles printed with those designs goes back to the group. 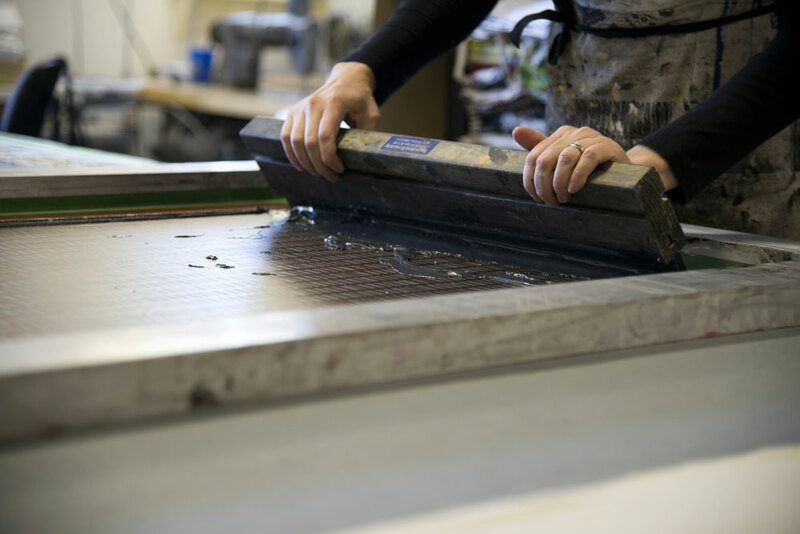 When Gerber began screen printing on her huge new table, she quickly realized she’d need an extra pair of hands to truly take advantage of the scale. 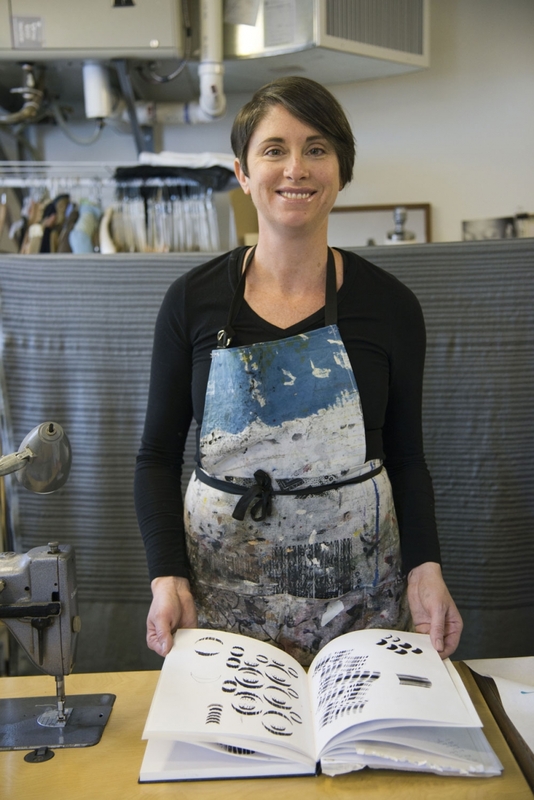 Artist and painter Kristine Zingeler first joined Gerber in the studio as an artist-in-residence, an arrangement that worked so well that she continues to assist once a week when full-width fabrics are being printed. Gerber continues to explore new ways to use her textiles and designs. These fabric samples are headed to the Campbell Dunsmore Group, a wholesaler catering to interior designers, decorators and architects. 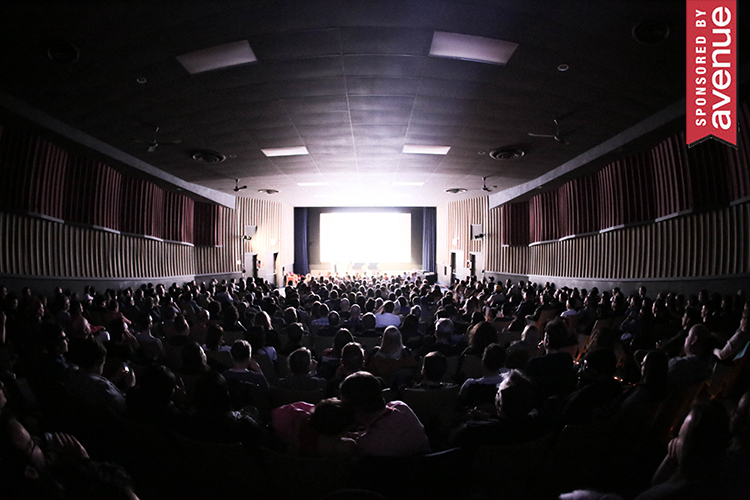 With plans to move to a new, larger studio at cSpace in the former King Edward School late this year, Gerber has her sights set on continuing to build community. She is looking forward to being able to make studio space and specialized printing equipment more accessible to other artists, offering rentals to those who may not be able to afford to set up their own full-scale printing studio. The larger space will permit her to start offering workshops, another of her long-term goals.